Chameleon Toy Mini Good Luck 1" Miniarture at Anwo.com Animal World® is Chameleon Lizard play toy lover fun. Made of safe, colorfast, durable, plastic this Chameleon toy replica has great color and features the incredible detail of a chameleon catching a butterfly on it's tongue. The Chameleon Toy is perfect for educational school projects and measures a large 1" long x 3/4" high x 1/2" wide. 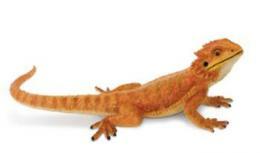 Shop our Chameleon Gifts Store at Anwo.com Animal World® page for additional Chameleon gift items. Shop our Animal Toy Replicas Store at Anwo.com Animal World®. page for our great selection of plastic animal toy miniatures.